March 31, 2016—Canada’s top triathletes will be swimming, biking and running into the Nation’s Capital Region for the 2016 and 2017 Canadian Sprint and Standard Distance Triathlon Championships, along with the CAMTRI Continental Cup. 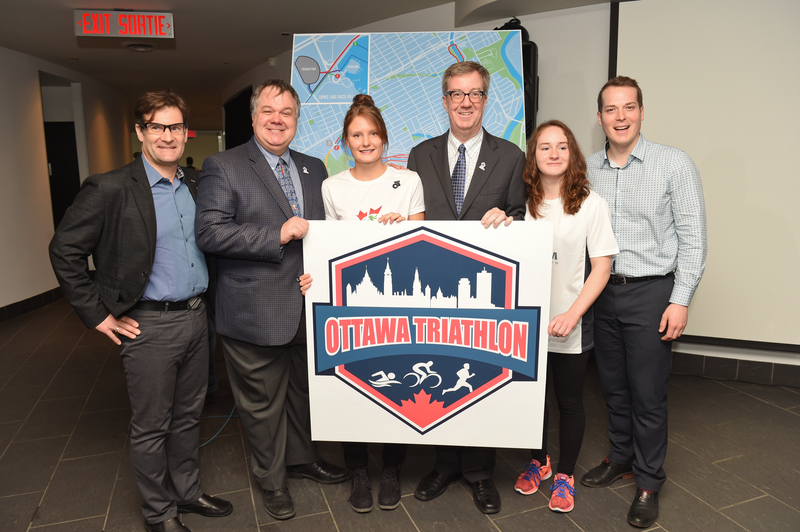 Triathlon Canada made the announcement in partnership with Mayor Jim Watson and the City of Ottawa, along with Ottawa Tourism, on Thursday at Dow’s Lake Pavilion – the host venue of the premiere domestic triathlon race event for the next two years. Richard Price, who has more than five years of international experience working on the World Triathlon Series and at the 2012 Olympic Summer Games in London, will lead the competition team. Price and his team have developed a spectacular city-based triathlon minutes from Ottawa’s core. Located just three kilometres from Parliament Hill, athletes will dive into Dow’s Lake for a single lap swim. The bike courses will be flat and fast with a 20-kilometre out and back loop. The run will take athletes past many of Ottawa’s top sights and neighbourhoods while winding along the beautiful Rideau Canal and past Carleton University before making a turn to the finish stadium near Hog’s Back Falls. To register for the Ottawa Triathlon, or for more information, please visit http://ottawatriathlon.ca. Triathlon Canada is the governing body for triathlon in the country. Recognized as an Olympic medal sport since 2000 and Paralympic medal sport as of 2016, Triathlon Canada’s mandate is to promote, foster, organize and develop the sport of triathlon, and its related disciplines, in Canada. For more information on Triathlon Canada, please visit us at www.triathloncanada.com.